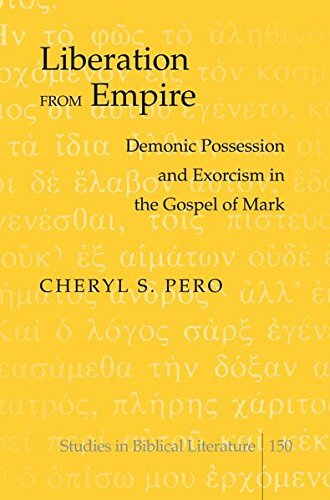 Liberation from Empire investigates the phenomenon of demonic possession and exorcism in the Gospel of Mark. The Marcan narrator writes from an anti-imperialistic point of view with allusions to, yet never directly addressing, the Roman Empire. In his baptism, Jesus was authorized by God and empowered by the Holy Spirit to wage cosmic war with Satan. In Jesus’ first engagement, his testing in the wilderness, Jesus bound the strong one, Satan. Jesus explains this encounter in the Beelzebul controversy. Jesus’ ministry continues an on-going battle with Satan, binding the strong one’s minions, demonic/unclean spirits, and spreading holiness to the possessed until he is crucified on a Roman cross. The battle is still not over at Jesus’ death, for at Jesus’ parousia God will make a final apocalyptic judgment. Jesus’ exorcisms have cosmic, apocalyptic, and anti-imperial implications. For Mark, demonic possession was different from sickness or illness, and exorcism was different from healing. Demonic possession was totally under the control of a hostile non-human force; exorcism was full deliverance from a domineering existence that restored the demoniac to family, to community, and to God’s created order. Jesus commissioned the twelve to be with him, to learn from him, and to proclaim the kingdom of God by participating with him in healing and exorcism. Jesus expands his invitation to participate in building the kingdom of God to all those who choose to become part of his new dyadic family even today. View More In Angelology & Demonology.